Oil on panel, 79 x 129 cm. A boat is dragged onto shore by the Zuiderzee in the Netherlands. Further in the distance, copses and a lone tower rise over a wall behind the boat jetty. Two koffs (flat-bottomed ships) have moored at the jetty while two warships are sailing out on the lake. Golden light pours out from behind the trees, illuminating the tranquil blue sky. Simon de Vlieger started by painting scenes of stormy seas. Influenced by Jan Porcellis, he would later strive to capture the calm and atmospheric mood that characterised the windless seas off the shores of the Netherlands. 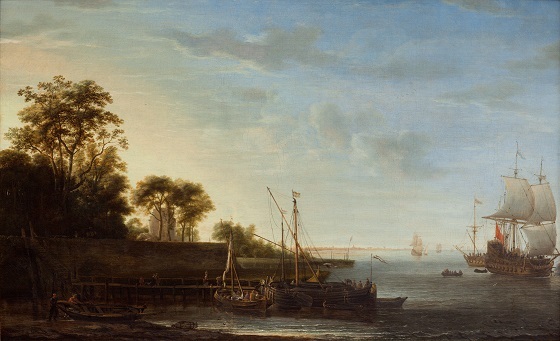 The passive sky, low horizon line and light colours became recurring elements in de Vlieger’s late-period marine paintings.